I want to introduce you to our sponsor this month. HomeschoolMovieDeals and tell you what they are offering. First, let me remind you of the movie Dolphin Tale. Dolphin Tale is a movie about a real live Dolphin named Winter. Winter washed onto the shores in Florida and had to have its tale amputated. Winter taught himself to swim despite not having his tail to assist him. Inspired by a true story, Dolphin Tale is about courage, ingenuity, and never giving up. Sawyer (Nathan Gamble) is a young boy who’s struggling with school and doesn’t have many friends other than his cousin Kyle (Austin Stowell). When Kyle, a star swimmer, joins the army to earn money for college and is called to active duty, it looks like Sawyer is destined to spend his summer alone tinkering in the garage and attending summer school. Sawyer stumbles upon a dolphin that’s been severely injured, becomes fascinated by dolphins, and is suddenly intellectually engaged like never before. In spite of his shyness, he forms a friendship with marine rescue doctor Clay (Harry Connick Jr.) and his daughter Hazel (Cozi Zuehlsdorff) and, more importantly, a special and very powerful bond with the rescued dolphin, who’s dubbed Winter. As the newly formed team struggles to save Winter’s life and ensure her continued safety, financial concerns, an accident that leaves Kyle crippled for life, and a hurricane all seem to join forces against them. In the end, it is Sawyer’s determination, coupled with a little bit of luck and a lot of ingenuity from an army doctor (Morgan Freeman) who specializes in prosthetics, that helps make each member of the team, including Kyle and Winter, whole again. The talented cast does a great job of creating completely believable characters, but Gamble, Zuehlsdorff, Connick, Freeman, Stowell, and of course Winter, who plays herself, all deserve special mention. While the story of an injured animal rescued and rehabilitated has certainly been told before, this film is emotionally powerful and will absolutely captivate children and adults alike. My youngest son loves fish and all things that belong in water. All of my kids love animals, so Dolphin Tale is a great film for us. We were all inspired by the story. So now I have the chance to promote Dolphin Tale 2 for HomeschoolMovieClub! The sequel to the heartwarming and inspirational movie Dolphin Tale! In theaters September 19, 2014. Dolphin Tale 2 is another true story inspired by the life of Winter, a dolphin who was badly injured and needed a prosthetic tail to survive. In DT2, Winter gets a co-star named Hope! Hope is a baby dolphin who was rescued by the Clearwater Marine Aquarium in 2010, five years and one day after Winter was rescued. WHAT MAKES A GOOD ‘HOMESCHOOL DAY’ MOVIE? A good ‘Homeschool Day’ movie will be family friendly, deliver positive messages, and provides some intrinsic educational value. We may let you know about a lot of different movies on our website, but a ‘Homeschool Day’ movie has something special about it that we think our homeschool community will particularly enjoy, appreciate, and want to support. WHY GO AS A GROUP? Also, it makes a statement to have the homeschool community unite and let Hollywood know we have a voice. We can be a valuable force in the entertainment industry if we collectively let them know (with our ticket buying) what types of movies we want more of. HOW DO I JOIN THE ‘HOMESCHOOL DAY’ EVENT? First, register with ‘Homeschool Movie Club’ (free) so that we can provide you with any coupons, discounts, or perks that the studios or movie chains may offer to us. Then, after you have registered, you may go to our ‘curriculum’ page and download free curriculum that corresponds to the movie. It is a great way to get the most educational mileage out of the experience! Lastly, go to your local movie theater on the date that is designated ‘Homeschool Day’ and be a part of a larger movement of homeschoolers. Some movies may have fun contests attached and items of clothes to wear to the event so you can ‘spot’ other homeschoolers. HOW DO I PUT A FIELD TRIP TOGETHER FOR MY GROUP? If you want to put a field trip together, first register with ‘Homeschool Movie Club’ on the website (free) and then contact usby email and let us know you are interested in setting up a field trip so that we can give you additional resources, freebies, possible group rates, and other perks when they are available. Each movie may have different coupons and prizes and we want you to be the first to know about it. You will also be entered for the chance to see an early screening if a movie comes to your area. WHAT IS OUR PHILOSOPHY ON MOVIES AND MEDIA? We believe every family must be in charge of deciding what is best for their family to see and experience. We try to deliver as many tools for families to make an informed decision. We also believe media can be a tool to foster discussions, emphasize a point and enhance what we are learning in our studies. We will always do our very best to screen movies and let you know ahead of time if there is anything that may be of concern. We also encourage use of existing websites like “Plugged In”, where you will get a detailed review and account of language, attitudes, world views, etc. We are sensitive to the conservative nature of the homeschooling community and realize that just because something is rated G and coined a ‘family friendly movie’ does not necessarily make it a good match for your family. 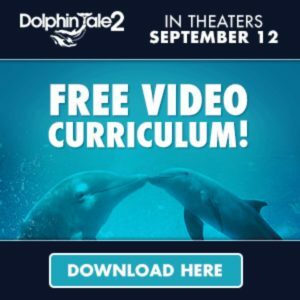 We chose Dolphin Tale because it is a perfect match for homeschool families and because of the inspiring true life story of Winter the dolphin. The story’s characters are filled with integrity, and there are extraordinary lessons and educational value. As an amazing bonus, the film has a character that is homeschooled not only in the movie, but in real life as well!!! It truly has all the qualities we look for in a ‘Homeschool Day’ movie! Make sure you register atHomeschoolMovieClub.com so that you will be the first to know about our upcoming freebies, contests, movie discounts, and more exciting news about our first ‘Homeschool Day’! Check out the trailer for Dolphin Tale 2 below. I hope you will join HomeschoolMovie Club and also join us on September 12th for Homeschool Movie Day!! !